Enough technology has already been invented to solve Climate Change and Peak Oil. We just need implement them and to get them to go down the so called cost curve. Here are some of the main ones with links. 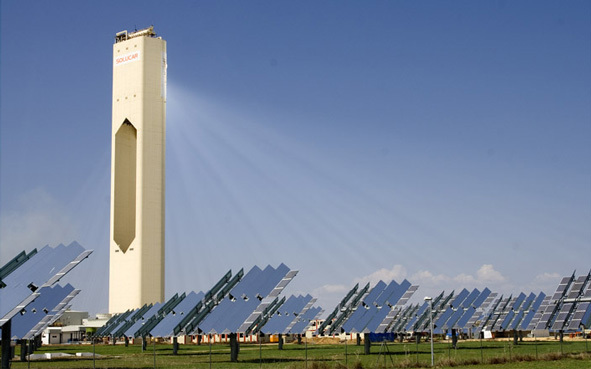 Solar Thermal power stations with salt storage. Torresol Energy. Beyond Zero. See their plan to power Australia with 100% renewable energy. See "Zero Carbon Australia Stationary Energy Plan". Grid size batteries. NAS Batteries by NGK Ltd. Liquid Metal Battery. Liquid Metal Battery TED talk. Wind Turbines. Click here for an interesting article on Wind farms bringing the cost of electricity down. Solar P.V. 40% efficient cells:- https://newsroom.unsw.edu.au/news/science-technology/unsw-researchers-set-world-record-solar-energy-efficiency. HVDC power lines (High Voltage Direct Current). Watch this excellent Youtube video by Seimens (7mins 43secs). The video gives an overview of the advantages of DC over AC. The power loss in a HVDC is in the order of 8% compared to High Voltage AC lines that loose in the order of 30% to 40%. Did you know Australia has a number of HVDC lines including Basslink connecting Tasmania to Victoria? Predicted to become cost competitive this decade. DOMESTIC STORAGE will become cheap enough for people to add it to their home solar. Article on how quickly battery costs are dropping. Expected to get down to $100 / kW this decade (2020). TESLA are building a factory to mass produce their batteries for their vehicles. ( Not just for vehicles though, can be used for anything. YOUNICOS are building batttery storage for the Grid for frequency and voltage Stabilization eliminating the need for Coal and Gas Peaking plants that do this now. Younicos: German battery storage company. ".....battery systems that it says can stabilize the grid faster, cheaper and with Greater precision that conventional generation." 5 MW unit enters service: "The 5 MW battery is claimed to provide the same control power as a conventional (coal) 50 MW turbine."